With local food growing as a concern for many urban residents, restaurants are beginning to respond to consumer demands. By hyper-locally growing organic food, restaurants not only attract and retain a new and growing customer base, but they also feel positive economic impacts of this practice too. By growing their own produce, “Roof-to-Table” restaurants can feel major savings in their supply costs. An initial investment of course must be made to design, install, and operate a soilless garden or greenhouse in a restaurant. 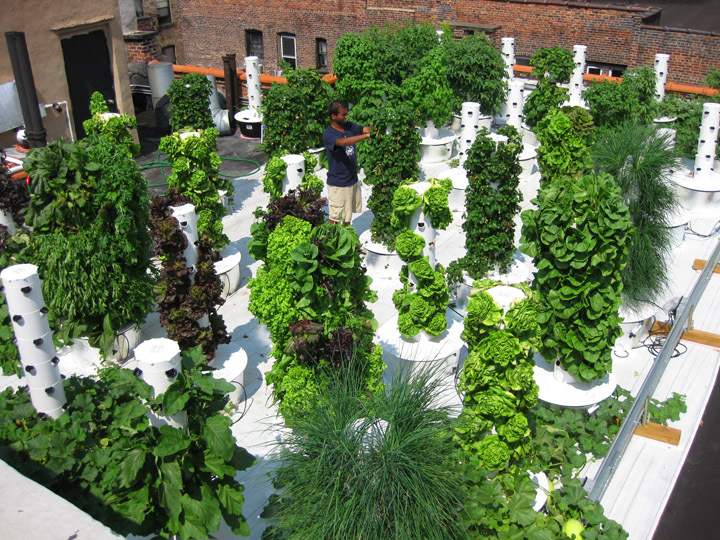 Over time however, the restaurants performing their own urban agriculture will start to feel the return. Not only is the food fresher and of better quality, but the peripheral benefits of on-site soilless gardening for restaurants also include a noticeable improvement in indoor air conditions. All of these small impacts lead to creating a better overall customer dining experience. The Urban Cultivator is a product specially designed to support restauranteurs who wish to capitalize on the on-site soilless gardening practice. This free-standing, controlled hydroponic garden allows chefs to harvest their own micro-green supply mere steps away from their customers. 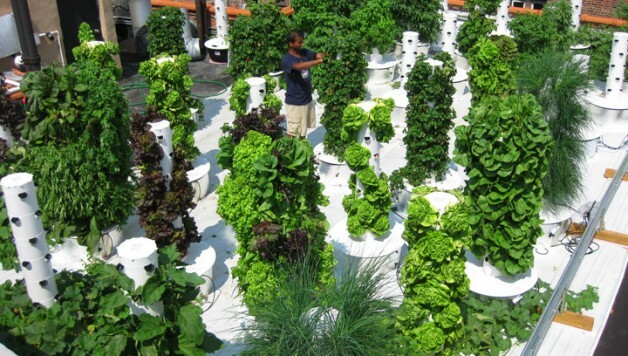 Another practical method for on-site soilless gardening for restaurants is by way of aeroponic tower gardens. Bell, Book, and Candle is a restaurant in New York City that prides itself on it rooftop garden. Throughout the year the restaurant harvests over 30 different varieties of herbs, greens, and other produce. The 60 aeroponic tower gardens help the restaurant reduce their own carbon footprint by limiting their reliance on importing food from surrounding areas. Nana in Chicago, is a restaurant that prides itself on being locally and sustainably sourced. To proves it commitment to urban food production, the restaurant installed its own 100 square-foot hydroponic garden in the building’s basement. Here they are able to harvest their own greens and herbs offering their clientele the freshness they demand.